Poverty is multifaceted. In this study, multiple data sources and analytical approaches were used to analyze multidimensional poverty profiles in Taiwan. The Alkire–Foster method and a multilevel modeling technique were applied to examine multidimensional poverty and multilevel factors, respectively. The resulting estimates of multidimensional poverty indicated disparate multidimensional poverty profiles for the four districts of Taiwan. 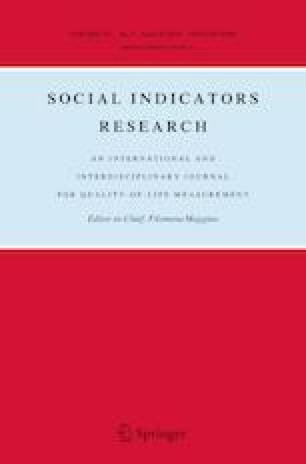 This study’s findings on the multilevel determinants of multidimensional poverty demonstrate that the levels of multiple dimensions of deprivation vary across cities and counties according to microlevel factors including age, socioeconomic status, marital status, household income, and household size. At the macrolevel, level of urbanization and service-to-manufacturing ratio were found to significantly correlate with level of multidimensional poverty. Finally, the study presents the implications of these findings for antipoverty policy and provides suggestions for future research. About the multidimensional poverty measures, part of the data and deprivation indicators are rewritten from the first author’s PhD thesis named “Multidimensional Poverty Measurement and Analysis in Taiwan”. The PhD thesis was supported by a research scholarship from the Ministry of Science and Technology (Grant No. MOST 104-2420-H-194-008-DR). This work was supported by the Ministry of Science and Technology in Taiwan (Grant Nos. MOST 104-2420-H-194-008-DR and MOST 107-2410-H-020-001-). The study used the data from the National Health Interview Survey Original Database provided by the Health Promotion Administration, Ministry of Health and Welfare, National Health Research Institutes and Food and Drug Administration, and the Ministry of Health and Welfare. Finally, we appreciate the anonymous reviewers for valuable comments. Alkire, S., & Apablaza, M. (2016). Multidimensional poverty in Europe 2006–2012: Illustrating a methodology (OPHI working paper 74). Retrieved from Oxford: http://ophi.org.uk/multidimensional-poverty-in-europe-2006-2012-illustrating-a-methodology/. Accessed 07 Apr 2019. Alkire, S., & Foster, J. (2007). Counting and multidimensional poverty measurement (OPHI working paper 7). Retrieved from Oxford: http://www.ophi.org.uk/working-paper-number-07/. Accessed 07 Apr 2019. Alkire, S., & Roche, J. M. (2011). Beyond headcount: Measures that reflect the breadth and components of child poverty (OPHI working paper 45). Retrieved from Oxford: http://www.ophi.org.uk/new-approach-to-child-poverty/. Accessed 07 Apr 2019. Alkire, S., & Santos, M. E. (2010). Acute multidimensional poverty: A new index for developing countries (OPHI working paper 38). Retrieved from Oxford: http://www.ophi.org.uk/acute-multidimensional-poverty-a-new-index-for-developing-countries/. Accessed 07 Apr 2019. European Commission. (2016). Air quality standards. Retrieved from http://www.ec.europa.eu/environment/air/quality/standards.htm. Accessed 07 Apr 2019. Levine, S., Muwonge, J., & Batana, Y. M. (2012). A robust multidimensional poverty profile for Uganda (OPHI working paper 55). Retrieved from Oxford: http://www.ophi.org.uk/a-robust-multidimensional-poverty-profile-for-uganda/. Accessed 07 Apr 2019. Santos, M. E., Villatoro, P., Mancero, X., & Gerstenfeld, P. (2015). A multidimensional poverty index for Latin America (OPHI working paper 79). Retrieved from Oxford: http://www.ophi.org.uk/a-multidimensional-poverty-index-for-latin-america/. Accessed 07 Apr 2019.